Mark and Tracy Severn are hoping to make it three wins in a row with their Beef Shorthorn bull. Angela Calvert reports. Tracy and Mark Severn with Beef Shorthorn bull Millerston Jester. WINNING the Beef Shorthorn championship at the Royal Highland Show last year was the highlight of an extremely successful show season for Millerston Jester which saw it take breed championships on all of its eight outings including four inter-breed titles. A win at the show in 2016 means owners, Mark and Tracy Severn are now hoping for a hat trick with their three-year-old bull. Jester was bought privately from breeder, Jack Ramsay, Mauchline, Ayrshire, at nine months old after being seen on its mother on a herd visit. But the Severns are no strangers to show and sale ring success since starting their Highlee herd 11 years ago. Their first animals, a cow and calf and a heifer were bought as a 40th birthday present for Tracy by her husband. Prior to this they had bought in rearing calves to sell as stores but got the showing bug by helping friends with their Dexter and South Devon cattle. They began showing their Beef Shorthorns almost immediately and success soon followed with the heifer, Sandwick Duchess Zoe, taking the female and reserve breed championship at the Great Yorkshire Show. The couple who run a machinery moving business live in Barkisland near Halifax where they have about 20 hectares (50 acres), a mix of owned and rented land within a seven-mile radius. The herd has now grown to 12 cows plus followers which calve in early spring. Heifers generally calve at two-and-half to three years old to give them time to mature. Although, as Jester is such an easy calving bull some heifers have been put to him to calve at two years old and Mark and Tracy are delighted with his first full crop of calves on the ground this year. Temperament is important and all cattle are halter-broken as calves. Very little stock is bought-in other than young bulls to bring on either as stock bulls or to sell on and it was one of these Poyntington Himself which provided their best sale price of 8,500gns after taking the championship at Stirling bull sales in February 2016. In addition to selling at Stirling, an increasing number of bulls are sold privately from home particularly to dairy farmers and one was also sold to the Prince of Wales for his herd at Dumfries House. Females are only occasionally sold and those from the three main families, Enya, Rose and Duchess are always kept as replacements, although longevity is one of the key traits of the breed with Duchess Zoe still in the herd having had its eleventh calf this year. 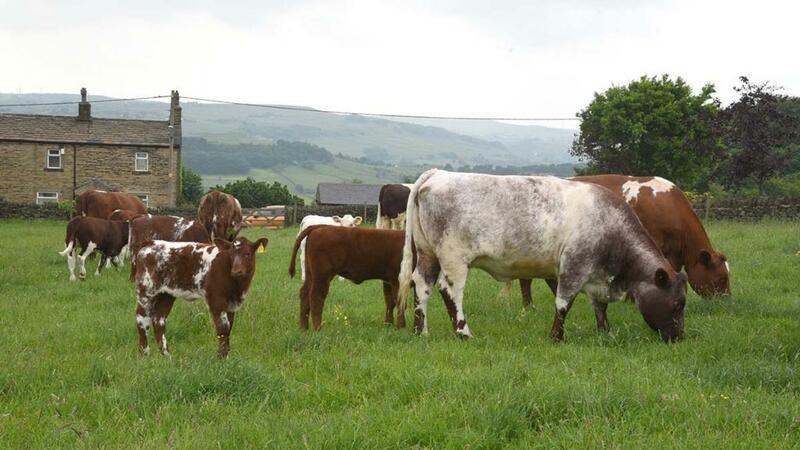 Mark says: “Shorthorns are becoming more popular with both pedigree and commercial buyers with females in particular always making decent money. Commercial buyers put a bottom in the market and the Morrison’s scheme has really helped. Temperament is also important to the Severns as Tracy does most of the day-to-day work with the cattle and they are all halter broken as calves. They attend about 10 shows a year and try to visit a new one each season although they stay in the north. The herd has now grown to 12 cows plus followers which calve in early spring. Tracy explains: “Pre-movement TB testing is having a big impact on shows and we always stay within the four-year TB testing area. This year they are planning on taking a team of six to Ingliston which is one of the highlights of their show calendar. Tracy adds: “The facilities for exhibitors are very good with plenty of room and the security is good which is important. “Plus, the atmosphere is always great, but then it always is among the Beef Shorthorn exhibitors who are a fantastic bunch with everyone helping each other out.